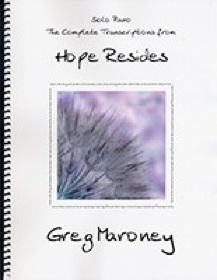 Hope Resides is the companion sheet music book to Greg Maroney’s 2013 release by the same name. 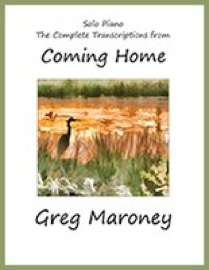 Dedicated to Jean (Greg’s mother-in-law) and the other 5.2 million Americans with Alzheimer's, this book contains note-for-note transcriptions of some of Greg’s best music to date. 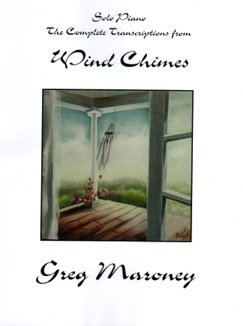 I really like that this collection contains some of Greg’s more turbulent music as well as his tender pieces. Sometimes playful and sometimes darker and more stormy, there is music with a wide variety of moods and playing styles. The transcriptions were done by the composer himself, and I edited and proofed. Greg is an outstanding pianist as well as composer, so these pieces are not for beginners, but pianists at an upper-intermediate to advanced playing level will find much to love about this book. The transcriptions are clear, roomy and easy to read. Metronome settings, dynamics, and expression are also clearly notated to match the recording as closely as possible, while allowing room for each pianist’s own interpretation and emotional expression. The book is spiral-bound to stay open on the piano and insures that the book will last a long time. 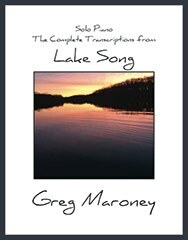 Available from gregmaroney.com and Amazon, I give this songbook my highest recommendation.